These ground-breaking female comics disapproved the old sexist myth that “women aren’t as funny as men,” leading the way for equality on the stand-up comedy circuit, on television, and beyond. Women have often been successful in the music and drama circles. It was usually unheard off especially in our own African society to have a woman doing comedy. In our changing world Bulawayo has been introduced to a rising comedy sensation better known as Mrs. Mahlekisa. She has been described as a ground breaker in this field which was once male dominated. Its world cup and I’m just thinking which team Brazil NO, England NO Portugal NO but Christiano Yessssssssssssssssssssssss by all means…. 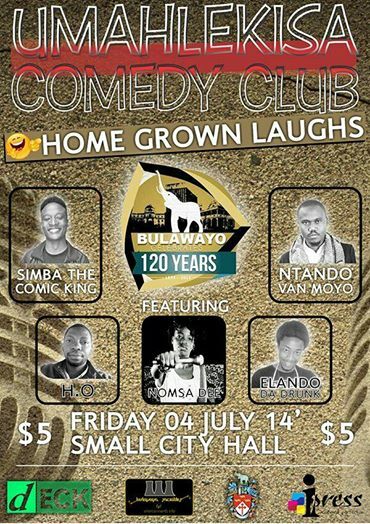 Diana Nomsa Chibi Muleya better known in the comedy business is one rising female comedy sensation who has slowly bought a change in the comedy scene. We had a chat with Nomsa D last week as she told us more about herself and how the two time NAMA nominee Ntando Van Moyo and industrious poet and writer Tshwarelo Mathobe made her realize her rising career. Can you tell us how did it all start? I was at Ibhayisikopo film project run by veteran filmmaker Priscillah Sithole that is when I met Ntando Van Moyo professionally. Tswarelo Mathobe is the one who suggested I do comedy. I guess I was funny and that’s why they wanted me to join the comedy ship. It is from them I used to do with Tshwa, Prince GodongaMahlangu, Ntando Van Moyo and Clive Chigubhu. Describe your early career film? I’m passionate about using the camera that’s my other job for now I have been doing weddings and funerals but I’m keen on photography. During my days at ibhayisikopo we did short films as a class we did Freeman by Ericah Gwetai lovely storyline i tell you, I was the costume designer and that wasn’t what I wanted because I wanted to be a producer which I got to be on the our other film Ghetto New Year by Juliet Makawa and in that film fellow comedian Clive Chigubhu acted . At the moment I’m not hands on film as am still nursing my new baby comedy. The comedy business is growing, and I have seen the comedians are a close family, they are encouraging and a friendly folk we are a funny family. What is your vision for Zimbabwean comedy? And when was your big break? December 2013 will forever be imprinted it is the day I started it all. It was during the Mayor’s Christmas Charity show. The society that I live in inspires my creativity and working with Ntando and Tswarelo. Has anything ever went wrong when on stage? Something has went wrong once I was performing at Horizon and people were not laughing I was so frustrated but I didn’t walk out of the stage, I continued with my set. Eish I do get nervous I get nervous a lot. Ntando can confess to that as I work closely with him, during our last show I told him I wasn’t going to perform. Butterflies do show up and I look at the people and I think am I going to be funny. Which is your biggest show ever? Haven’t had a solo show yet it takes time to get through but so far 1000 nights of laughs was a huge show for me. Does being a comedian pay? It is quite a hustle financially but if you love what you are doing money becomes secondary, but we all know bills, bills and bills they need to be paid and yes the money hasn’t been that much but we getting there. I went to Haig Park Primary School and briefly Queen Elizabeth 2, and then Mzlikazi High School. I’m not married, but a mum to Christon I’m in a relationship. Where would you want to perform in the near future? I would love to do a performance in my church like at a crusade or something clean that’s my ultimate goal. Any Comic line for our readers? Thanks Nomsa D for your time.